Truly, gardening is one of the least inexpensive activities that one can do. Gardening can be fun especially when you get to start planting. However gardening is so much more than just placing seed into the soil and watering them. There are a lot of activities that happen even before one gets to that point. There are also numerous other expenses that come along with planning and creating your garden. In order to grow healthy plants in your garden, one has to invest an amount to get the soil rich and ready for planting. Of course, when it comes to growing your plants there should be no qualms about giving it what it needs. So when the plants in your garden are in need of a fertilizer, you should be ready with a fertilizer to supplement the soil to provide for the nutrient needs of your plants. Coughing out the money to meet the plants every need is the thing about gardening that people have a lot to say about. Fertilizers do not exactly come out cheap. Good fertilizers do come at hefty prices. Fortunately, we do not have to spend a s much on the fertilizer since we can actually make our own compost. A compost is actually a form of organic fertilizer that anybody can actually do in their homes. The process of composting is actually a lot like recycling. Instead of throwing out wastes such as paper, fruit peelings, vegetables and leaves, you can group them together as biodegradable wastes and place them in a compost bin for composting. It is actually very easy to do. However, before you even get there, you have to have a compost bin to use. Compost bins are where you collect together all your biodegradable wastes together with a bit of soil and some worms to jumpstart the process of composting. There are commercially sold compost bins that one can buy and make his compost in. However, the whole point of one composting is to cut back on the money that one has to spend while gardening. Buying a compost bin would not serve the purpose of saving. To be on the same page as cutting back on the costs on gardening, instead of buying a compost bin, you can actually make your own compost bin. Making a compost bin is not difficult. You do not have to be crafts master or an expert in woodcraft to make one. Furthermore, the things you are going to need are very cheap. You can even find a whole lot of them for free in your house. 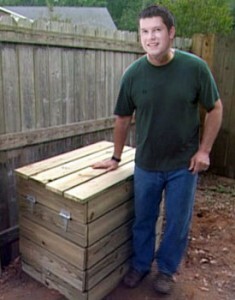 The principle in making compost using these compost bins are pretty much the same. Each compost bin as hits own advantages and disadvantages. Consider what works for you best before making one.